Well as a food blogger, one of the key Design Info that matter to me is the food presentation and coloring. 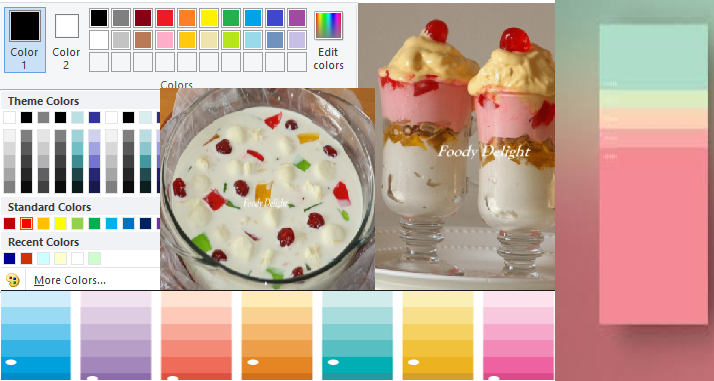 Well along with presentation what excites me the most is the food colors that revitalize the food looks. For instance if you wish to add some red flowers on a birthday cake, or create a blue bunny on a cupcake or make a blue ocean on the next candy, the process of getting that color is quite a challenging process. In the blog today, I will spend some time on food colors and how different shades can be created from basic three colors. When talking about different colors, i remember the popular Pantone Colour Guide TPG that we had used in US for a new project while evaluating the Design Info with a client. Well as exciting are the food colors, the different options to make those food color are much more exciting. For starters do remembers that there are many other color options beyond the three key colors(blue, red, and yellow) and making different food colorings can be a fun and easy way to add some delight to your food plate. Juices from daily eatable fruits and vegetables (beets, pomegranate and many more) and spices (cinnamon, turmeric etc.) can create beautiful, natural colors for your food. You normally mix the key colors together to get subordinate colors, and then mix the subordinate colors together to get further more colors. The New Pantone Color Guide for Fashion, Home & Interiors provides Fashion & Home Color guide of 210 new colors. With two separate splits for better usage,the Guide has all colors split into 2 for better usage. This Pantone TPG Colour Guide is widely used in Home Furnishing, Architecture, Textile Color Matching, Furniture and is the best alternative to expensive TCX products.